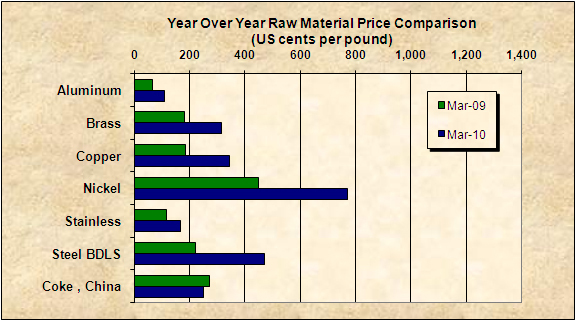 Prices of raw materials used to make precision machined products are up substantially, ranging from 44% to 114% from March 2009- March 2010 for 6 of the 7 materials we track. Low inventories, increasing demand, idled production facilities, are among the factors involved here in North America. As are the historic iron ore agreement and continued high demand in China. 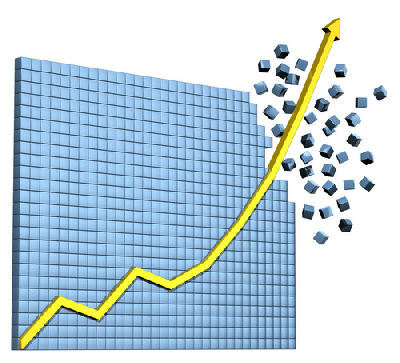 Fuel price increases also impact freight, which is an important factor in our business. We will not be shocked to see monies paid for steel in May to be $80 per ton higher than they were in April based on already announced price increases and the current price on #1 busheling which determines surcharges. Read more and download the .pdf report here. This entry was posted on Thursday, April 8th, 2010 at 3:43 pm and is filed under Engineering, Front Office. You can follow any responses to this entry through the RSS 2.0 feed. You can leave a response, or trackback from your own site.